September 23, 2013 By This post may contain affiliate links. 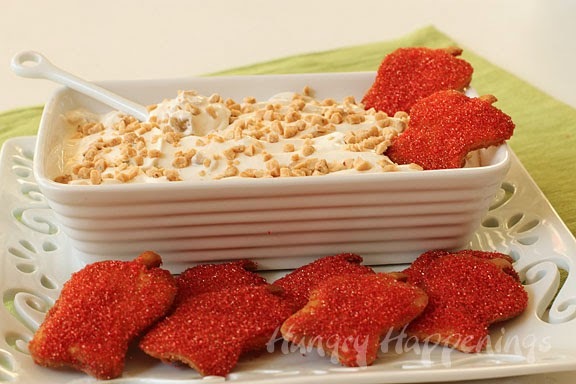 This amazing Cinnamon Pita Chip Apple Crisps with Toffee Apple Dip is an appetizer you won’t be able to get enough of! 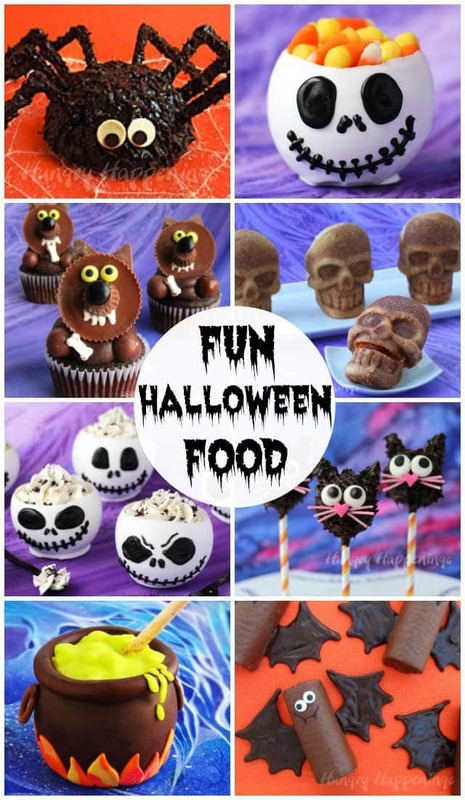 Make it for any occasion you’d like, your friends will be absolutely impressed! During the fall I crave apples. They are at their peak of flavor and as an added bonus they are always on sale. I remember as a child not being a big fan of apples. All we ever had were Red Delicious Apples. I never understood their name. To me they were tasteless, not delicious at all.Today, there are so many wonderful apple varieties, my favorite of which is Gala. For baking and cooking, I prefer Granny Smith’s. Their tart flavor and sturdy texture are perfect for this recipe. Yesterday I told you about the Apple Cloud Pie I created for Tablespoon.com. The combination of apple pie and cheesecake makes me swoon, so I decided to deconstruct my pie and change it up a bit to make a simple dip. 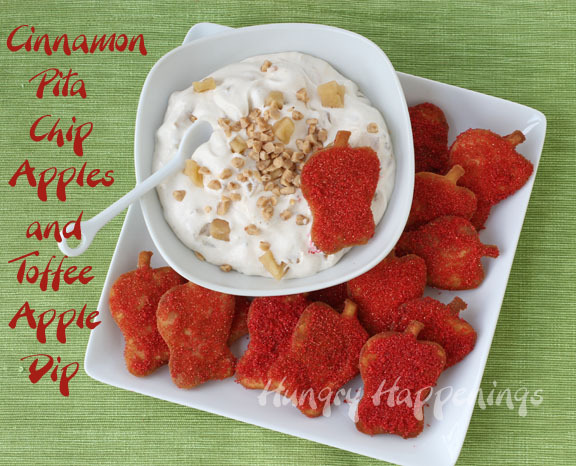 To add a festive touch, I fried up some apple shaped pita chips and sprinkled them with ruby red cinnamon sugar. It is a sweet combination. 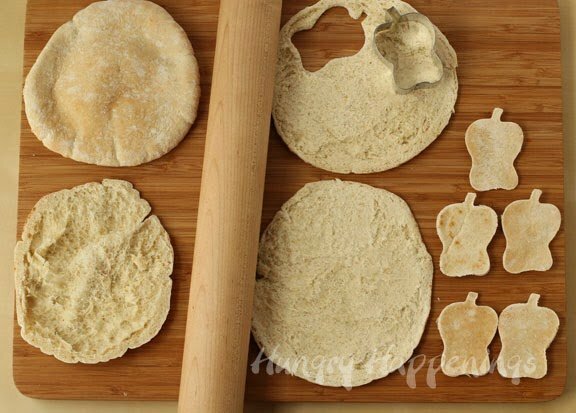 Divide each pita in half. To make it easier to cut, use a rolling pin to roll each half out flat. Cut out apples using cookie cutter. Pour red sugar into bowl and stir in some cinnamon, to taste. You’ll use about 1/4 teaspoon – 1/2 teaspoon of sugar for each apple chip, so measure according to the number of chips you want to make. Heat the oil in a fryer or stock pot to 375 degrees Fahrenheit. 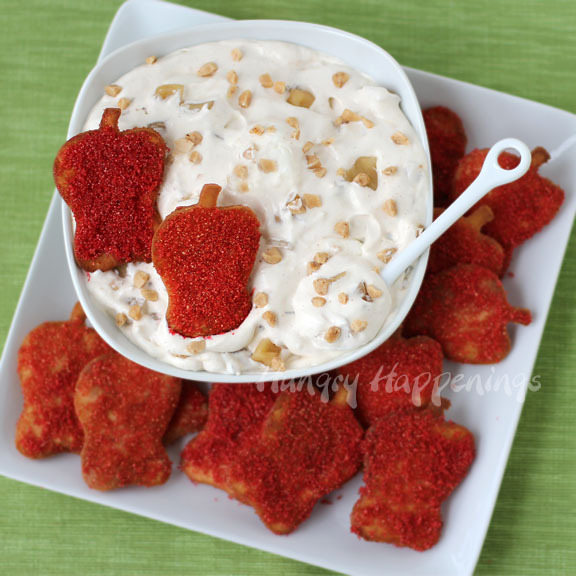 Fry apple shaped pita chips until golden brown, flipping them over midway through frying. 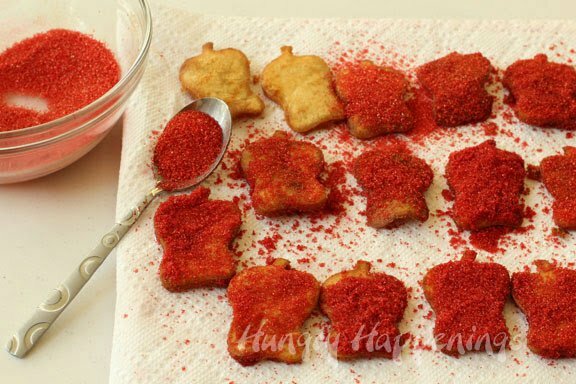 Set on a paper towel and immediately sprinkle some of the red cinnamon sugar over top. Allow chips to cool completely. Brush the sugar off the tip part of the apple, for a more realistic looking stem. Store in an metal tin to retain crispness for up to a week, otherwise serve the day these are made for best results. Wash, peel and cut apples into small 1/4 pieces. Toss with lemon juice. Melt butter in a skillet over medium heat. Add brown sugar and stir continuously until the brown sugar begins to dissolve. Add diced apples and cinnamon. Toss to coat and continue to stir until the sugar completely dissolves and the apples become tender, about 5 minutes. Allow this mixture to cool completely. Beat cream cheese and marshmallow fluff until smooth and creamy. Add Cool Whip and beat until just combined. Fold in the cooled apples and the toffee bits, reserving some to sprinkle on top, if you’d like. Pour into a serving bowl and serve. You can keep this dip refrigerated for up to 3 days. The you can think outside of the box gets me every time, These are so fun! I live in the uk . I am a granny , I love your ideas . Cool Whip is whipped cream that comes in a tub and is frozen. When it's thawed it is soft and creamy, just like homemade whipped cream, only it is very stable and wont seep. You can just swap out homemade whipped cream. If you do that, just be sure to serve it within a day or so for the best results. 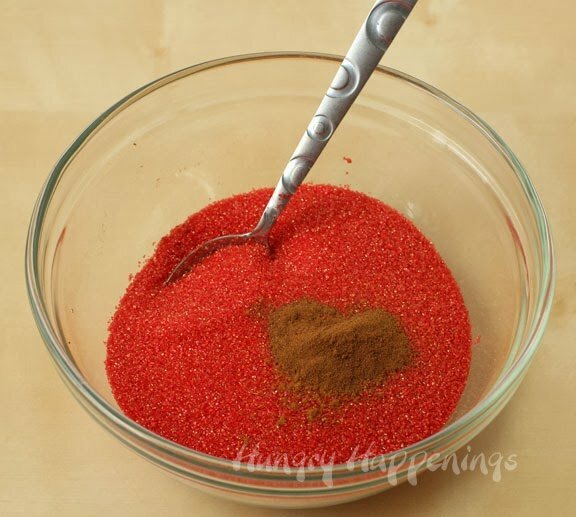 I love this idea once again and love that you used red sanding sugar with the cinnamon! Perfect! I must start making more dips!